I was born in 1956. I was brought up on the west coast of Scotland, in a small fishing village called Ardrishaig. I lived in Australia for over 6 years, working mostly deep in the outback of the Northern territory. My first hobby after leaving school at 16 years old was Scuba diving. I made it my profession. Using the money I saved working in the outback I went on a commercial diving course. This was at a training school set within Sydney harbour NSW. I then went on to deep Saturation diving, living in diving chambers for max one month trips at depths of around 500ft. This type of work has taken me all over the world, to Red China to war zone areas like Angola, Congo, Mid-East. Most of my work now is in the North Sea of Scotland. I live with my wife, Fiona & John (14 years) at the foot of the Cairngorm Mountain Ranges. Having looked at so many sport and activities, 9 years ago sleddogs came into my life. They play a major part of our family lifestyle. For me personally it's a way of life. There are no words that can describe the feelings I have after a long time away deep diving, and that first step back into the dog yard. All the family races and trains the sleddogs here and plays a huge part of the everyday working of the kennel. My son, John, has won many events and junior titles here in the UK, and has represented his country in events all over the world. We both have had some wonderful adventures with our dogs. He accompanied me to the world's southern city, Ushuaia. At the age of 11 years he was my registered handler in the stage race. He won the handlers' race running three of Tim White's dogs. Fiona, running three of our older dogs, won the Scottish 3-dog championship last year. Sadly over the years, with quarantine laws being as they were, the sport has stood still: 4-mile sprints are the norm, clubs with mainly showing interest have governed the sport. I was fortunate to meet up with Rick Atkinson not long after I started in the sport. He was, and still is, a great influence and a very good friend. Another good friend I have, who has given me the opportunity to learn more about sleddogs, and train and race in events with him and his dogs, is Tim White. I met Tim at a kid's race in Italy--John was racing there. That was back in 1996. Since then I have raced with him in Chile, Argentina, and last year, all over Europe. His endless energy and enthusiasm for the sport just amazes me. It was to Europe I looked for dogs and after a few phone calls to another mate, who now lives in Alaska, Dave Milne, he put me in contact with Helmet Peer. Helmet then put me on to Wolfgang Petz, a German, who Helmet reckoned had good Siberians. I met with Wolfgang many times and raced and trained with him. He told me he would set up a breeding for me but he needed to see how I got on in the Scottish sleddog events. That year I won everything, missed out by only seconds in the UK championship. I had raced and trained 4 dogs for all the 4 dog races in the UK. I only had 4 dogs and was up against some kennels with over 30 dogs in them. Wolfgang kept his word and the following year I drove to Germany to pick up my 3 new dogs. Those dogs went on to win many UK rounds and twice winners of the biggest sleddog event in the UK, as well as the Scottish twice. But it was racing abroad which opened my eyes. I started to lose interest in the UK racing-- when you drive over 500 miles to events only to race for 15 minutes, then come home again and do it again the next week--it just was not worth it. I thought there must be more to it than this! There was! Taking dogs into remote snow bound mountain areas now became my passion. It got me back on my sled, as all races in the UK are run on rigs. Truth is the showing club types don't like the snow, so they don't set up any events near the white stuff. We have 13 sleddogs at our kennel. All the dogs sleep in whisky barrels given to us by MacAllan Whisky (we live in whisky country). All dogs are tethered via chains with swivels, and picket posts. Bowls are secured to the face of each barrel. The barrels give great shelter from the weather. We have good bedding in them and they are secure. Around the dog yard, we also have a whisky barrel as a water storage area. This has a tap on it and is filled up at the end of each week. We have a 50m X 40m, 2m high wire fence. There is also another run that joins on to the main dog yard that we use as a hook up area for dog teams. All this area is floodlit at night and overlooks some magnificent highland mountain range. The management of the kennel is done by a twice a day procedure. Feeding is once a day. Eukanuba sponsors our kennel. Now that the quarantine laws are coming down, we are setting up an 8-dog team to race in mid-distance events in Europe next season. I have as my leader a German shorthair pointer called "Buster," two trail hounds, some other dogs coming in from Germany this summer, Alaskan dogs. The rest of my team this year will be made up of my German huskies. Sad fact is I will be the only team from the UK racing in those events and most of my team back home are not even looked at as sleddogs. Not only the clubs, but the governing sleddog body of the sport in the UK, are 100% pure breed. The rest of my kennel are Siberians. Running around a forest track for 4 miles does not really tell you much about dog teams, but taking them into and over the biggest mountain range in the UK does! My GSP was the first sleddog to the top of the UK's 2nd highest mountain, Ben Nevis beats it by 35FT. I will never forget his attitude that day on the mountain -20 below, blowing 35Kts, not a sleddog? Last year we had our first puppies. They ran loose behind the ATV. All the pups watched from their whisky barrels as the others trained, asking themselves "when can we go?" They are let loose to mix with the returning teams, etc. In training runs we pair them off to other dogs we know will help them learn. Short trips to start with, now at 6 months they are happy to run 5 miles--this is still fun and they love it. We have two ATVs for training at our kennel. One is a standard type, the other is a Kawasaki Mule. This is a great training unit. A bit bigger than an ATV, it has a bench seat that can carry a passenger safely for those long training trips. It's heavy enough to stop a big team from pulling it away without having to tie it off all the time. We take our dogs into remote areas and sleep overnight. The dogs have to cover all types of terrain and must know what it will take to complete an adventure or event. The most important racing factor for us happened only a few months ago. Now with the Q/laws coming down I can start training a dog team to compete in real sleddog events run under IFSS/ESDRA rules. Events like the Alpen trail and others, and compete against other mushers and teams without any discrimination on the breed type of my team. My strength as a musher is never to give up on anything, as I know not one of my team would give up on me. Another challenge has opened its door for us in Europe. In our sleddog life, training and winning races in the UK, I now will leave that to my son, John, who turns 16 years old next year. If UK mushers thought I was competitive, just wait until you see John and his team! As for me I'll train, race and listen! I am sorry to say my country will never go forward in the sport simply because of the discrimination that goes on and the people who run the clubs. They are not interested in kids racing, hold private UK championships. If you want to enter some events you have to send your dog team's "pedigree," and if they say it's ok you are in. This was brought in to stop the Zero bloodline of husky by BSHRA. There is some hope--others and myself have started a new club called the Cairngorm Trail Club. We have a committee of 8 and will be running a 3-day event with an open class in it. We have Rick Swenson as Patron, Thomas Gutt as Euro Adviser, and hope to set up a 2-day kid's race via the IFSS/Europe. My family and I are establishing the first adventure sleddog centre here in the UK, Cairngorm Sleddog Adventure Centre. This will be open from September/April. 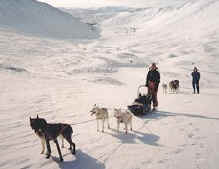 Web site is www.sled-dogs.co.uk Through our contacts all over the world we will promote the sport via this centre. I have two memorable sleddog experiences. 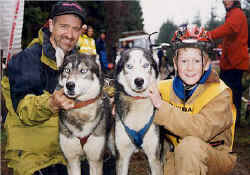 The first was taking my son (10 years) with me as a handler to the Ushuaia sleddog race Argentina, and Chile, running Tim White's dogs, my son and I won junior and senior events. 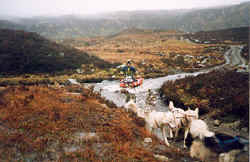 The second was taking my entire kennel over the Scottish mountains in mid winter with Rick Atkinson and Alister Taylor. Even my oldest dog, 12 years old, was not left behind. Both have much in common: good dogs, dedication, ability, and true mates. I prize those two events in my sleddog experiences over the years. Winning events here in my country had nothing on those few days on the mountain they call Ben MaeDui, home of the legendary ghost "The Grey Man."